NOBAY Apartments in Lakeland, FL offer a downtown lifestyle featuring mixed use residential and retail spaces. NOBAY features 55 residential apartment units on Bay Street and N. Kentucky Avenue in the heart of downtown Lakeland, FL. 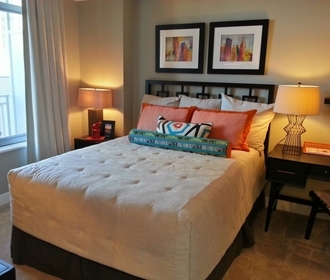 Our one bedroom units are spacious loft style apartment homes under 600 sq. ft. in size. Our two bedroom units are double master suites ranging from 1,180 sq. ft. to 1,270 sq. ft.
At NOBAY Apartments we feature urban living with several outdoor greenspaces featuring barbeque grills, patios, seating, and a small pet park-let. NOBAY Apartments downtown living beckons residents to assemble for a cold beverage, good food and lively conversations any time of the year. We are within walking distance from a variety of night life, restaurants and farmers market. Be a part of a vigorous downtown lifestyle and choose the NOBAY lifestyle for urban living. Here at NOBAY Apartments take pride in knowing you won't be disappointed. NOBAY Apartments offers a modern apartment, convient location, and a wonderful staff. Come by today to see what downtown living is all about!